At 38 weeks pregnant, I’m getting a little preview of things to come. I’m actually at the hospital right now, waiting for my nephew Grayson to be born. My brother and sister-in-law were due six days before me, but their baby has decided to come a bit early. I’m feeling great! I’m actually surprised I feel so good after hearing countless stories of friends being so uncomfortable their last few weeks. I have more energy right now that I did a month ago, and my back pain has significantly decreased. I think E has dropped some, which has made me a little more comfortable. It’s nice to be able to sit in a chair for more than a few minutes without being in pain. There’s not much to update here. He checked out great at my last midwife appointment. His heart rate was great and my belly is measuring right on time. He’s very active and even kept me up until 2 am one night. I swear he was trying to find the exit. I don’t allow the midwife to check to see if I have dilated any at my appointments, even though they offer each time. I feel that knowing that I have or have not dilated would just mess with me psychologically. You can stay at 5 cm for weeks or you can go from 1 cm to 9 cm in a few hours. It’s a sign of progress, but doesn’t tell you when your baby is actually coming. I also don’t want to take the chance of unnecessarily introducing bacteria. I mentioned this months ago, but I am still really into buffalo sauce lately. This past week, I’ve had a hot dog with buffalo sauce from JJ’s Red Hots and a salad with buffalo shrimp from Pinky’s Westside Grill. Of course, ice cream is a given. We are 100% ready to go. We don’t need anything else to be ready for this baby. At this point we’re just sitting back and waiting. I’m trying not to even think about if the baby coming early or late, today or tomorrow… He’ll come when he’s good and ready. 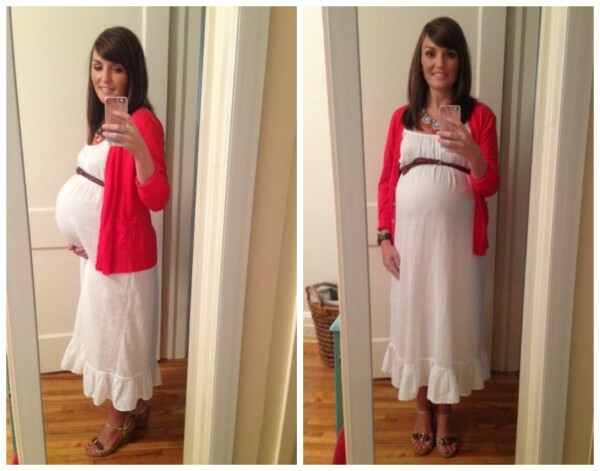 you look fantastic and its been a great (cooler) summer to be prego! hope all goes well and I cannot wait to see him and find out the name!! So exciting!! Are you going to give us a “it’s go time” entry or should we just assume not hearing from you or a few days=he’s here. *you’re …hate when that happens! WOW…so very close! How exciting! Wishing you a quick and easy delivery and a happy, healthy baby!! Document this. You are super high right now and in a few, you’ll start to see the drop. I didn’t believe it until I looked back at pics I was taking and saw holy crud, I was definitely sitting lower. Happy 38th week! I hope to meet this young man sooner rather than later 🙂 I’m glad to hear you’re comfortable and are just waiting for him to make his grand appearance!